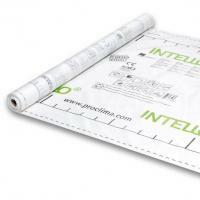 The new INTELLO® possesses the world`s most effective variable diffusion permeability under any climatic conditions. When blown-in thermal insulation material is used, reinforced INTELLO PLUS® is best suitable as a means of confining for the inside. INTELLO® provides maximum potential freedom from structural damage in timber-built systems. BAN Windrispenband für Aussteifungsverbände von Dachkonstruktionen als Zugstäbe. 40 mm x 50 m, 1,5 mm dicker, feuerverzinkter Stahl.